With the arrival of July we have hit the halfway point in the year – a great time to do a personal check-in and assess how the year is going. Are you moving toward the goals you have for the year? 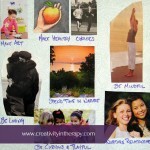 Are you living with the intentions that you set at the beginning of the year? Is it time to recommit to your intentions and goals? Or is it time to change your focus? 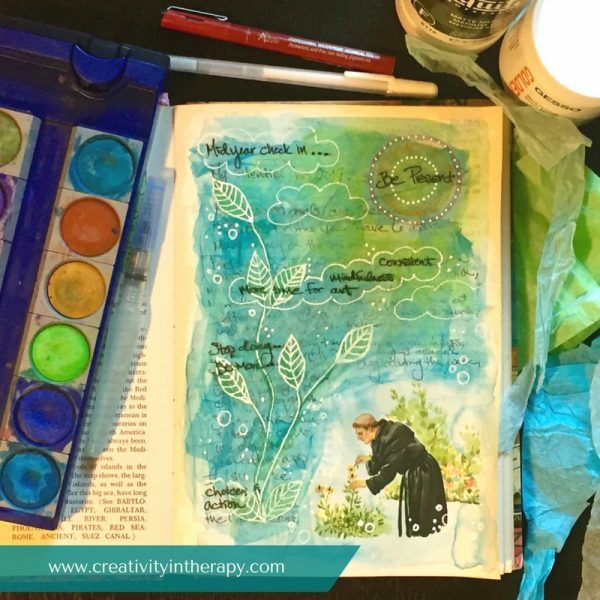 Art journaling is a great way to explore a midyear check-in – for yourself or with your clients – especially if you did some kind of goal or intention setting at the beginning of the year. What were your goals and/or intentions for the year? Have you been living your intention lately? What progress have you made toward any goals that you set? What is your motivation to recommit? 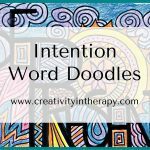 Why are these goals or intentions meaningful to you? Is there anything that you need to stop doing that is getting in your way? Is there something new that you need to start doing? What can you be doing more of? Hopefully your journaling and art can help you recommit, make shifts, and keep you motivated for the months ahead. Like with other art for goals or intention-setting, I would recommend keeping this somewhere that you can see it for inspiration. I decided to do my midyear check-in by doing some art journaling in the altered book that I have been working on. I put gesso over the page first to give myself a blank writing space. I am using a vintage encyclopedia for my altered book, so I chose a page with an illustration that fit with my intention and left it visible in the bottom right corner. Then I spent some time journaling on the page about my intention for the year – BE PRESENT – and how I have been doing with this. I then spent some time creating art on my art journal page. I layered tissue paper over the journaling, then rewrote some of the essential words from my journaling that I want to focus on going forward. I added watercolor and white gel pen over the tissue paper to create my design. 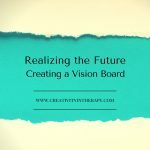 It was a very helpful process to reflect on how the year has been and in what ways I want to re-adjust my focus. 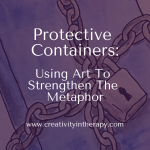 Making art about a topic always helps me to spend more time in reflection and visualize things more clearly, and sometimes it leads to new insights as well. In this case, the growing plant on the left side was inspired by the flowers already on the encyclopedia. The sun in the upper right corner developed out of the watercolor circles that I originally intended to become a mandala. However, after the art was finished it gave me a new thought. Just as the sun helps the plant to grow, so will being more present and mindful help with growth in my life. My 2016 resolution word was “Action” and my 2017 intention was “Be present” – these had seemed like opposites to me and I often feel like I have to choose one or the other. But as I continue 2017 maybe I can work on having them fit together more, not just swinging from one to the other. 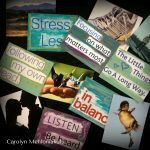 Being present does not have to mean standing still, maybe it can mean growth by being more intentional in the action that I take, as well as being intentional about having time for rest, observation, and appreciation. What are your thoughts? 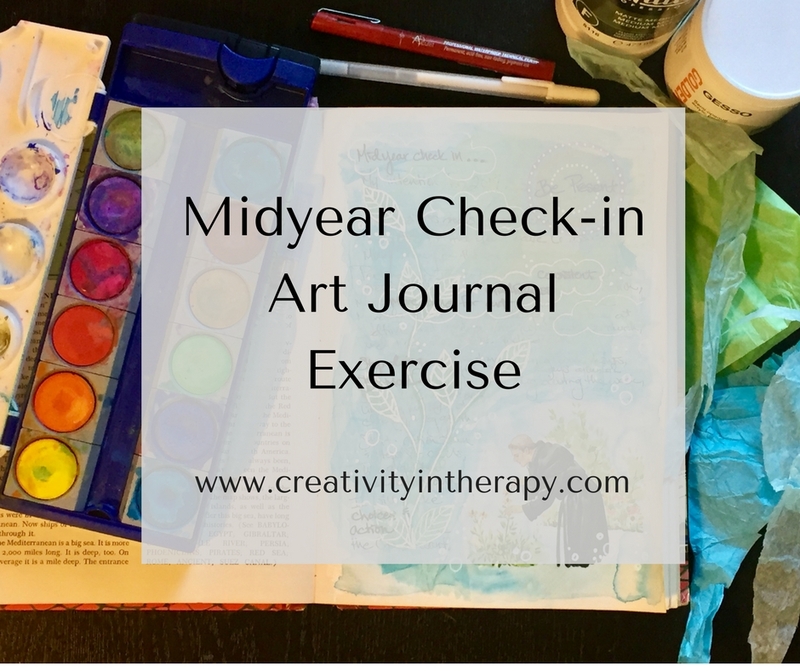 Have you done a midyear check-in with yourself or do so with clients through journaling or art? Share below in the comments! 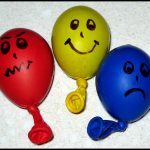 Really enjoyed reading this post. Gave me some good ideas of how to start with journalling. 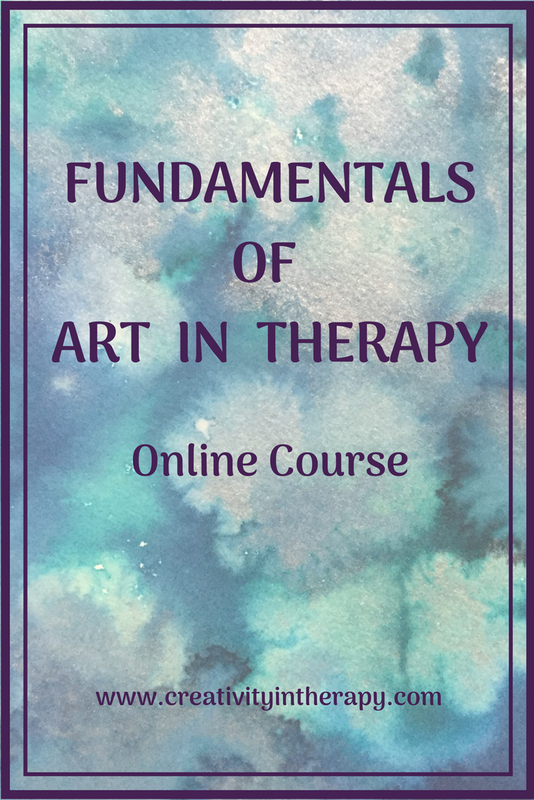 I have been working developing physical routine of an adult with depression using arts based therapy. 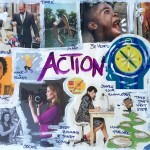 Please share more ideas on how to use art to help stimulate action and come out of inertia and hopelessness. Hello Trinjhna – Thanks for reading, and I’m glad that you found this helpful! 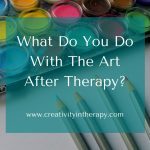 You might want to look at the posts about process art, coping, emotional expression, and vision boards/goals for other ideas that may be helpful for moving clients past inertia and hopelessness.